Yggdrasil has created some amazing slots over the years and the company has just announced its latest release, a Halloween slot called Pumpkin Smash. This great new video slot game will be sure to turn some heads as Halloween approaches and it is loaded with great features that can bring about many amazing payouts. The new game will be featured at many leading casino sites that feature Yggdrasil software and it will surely be a huge hit among those that enjoy feature-rich video slot games. This new game offers multiple betting options so it can be played by those with any sized budget and it can also be previewed in a free demo mode. The game will support bets that range from 0.20 to 100 per spin and the payouts are amazing, both from the base game and the bonus features. When it comes to bonus features on the new Pumpkin Smash Slot, players will be amazed. There is the Pumpkin Smash bonus which will be offered in the base game and the free spins. In the base game, this is triggered with two to five bonus symbols and players will then smash pumpkins to reveal anywhere from 2 to 20 prizes. These can include access to the free spins, multipliers from 2x to 7x or payouts ranging from 2x to 375x the bet amount. The free spin round is where many of the top game payouts will be enjoyed. Players will get between 7 and 30 free spins depending on how many bonus symbols triggered the feature. If the Pumpkin Smash bonus is triggered in the free spins, players can get more spins multipliers as high as 7x or payouts up to 875x the bet amount. The Yggdrasil no deposit bonus is a great way to get started enjoying the new Pumpkin Smash slot game and this can be enjoyed at many casino sites, including Casino Noir. 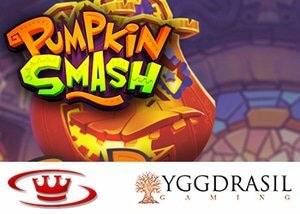 With a Yggdrasil no deposit bonus, players who are just getting started at the casino can benefit from some free cash at no risk and they can try out this new Pumpkin Smash slot with no obligation. After spinning on the slot with the no deposit bonus, players can continue playing the game once they make deposits and can generate some amazing payouts from base game combinations and accessing the multiple bonus features.